Released January 2010. Recognised as one of the youngest and most gifted contemporary composers, Guillaume Connesson brings together an imaginatively diffuse range of influences, from the riches of the musical traditions of his native France to John Adams, Steve Reich and the funk of James Brown. During the composition of the works making up the Cosmic Trilogy Connesson also drew inspiration from such sources as the paintings of Kandinsky and the physics of Stephen Hawking. After first discovering Connesson’s music in 2001, Stéphane Denève remarked on its ‘amazing orchestration… the quality of writing for large orchestra on the level of a Ravel or Stravinsky!’ During his tenure at the Royal Scottish National Orchestra Denève has regularly championed Connesson’s works and two parts of the Cosmic Trilogy, ‘Aleph’ and ‘Une lueur dans l’âge sombre’, were commissioned by the RSNO. These are dedicated to Denève; in fact, the symphonic dance ‘Aleph’ was a marriage gift. The Cosmic Trilogy evokes three moments in the history of the universe: the Big Bang in ‘Aleph’, the appearance of light and the stars in ‘Une lueur dans l’âge sombre’, and finally the explosion and death of a star in ‘Supernova’. Connesson’s works have been quickly appreciated by music lovers and performers for the exciting vitality they imbue, and the easy-going tonal strains that permeate them. The Guardian described the work as ‘bright-toned and imaginatively scored… crowd-pleasing, colourful music’. Chandos is delighted to present the first recording of the complete trilogy. Guillaume Connesson studied piano, history of music, choir analysis and direction at the Conservatoire National de Région de Boulogne-Billancourt, as well as orchestration at the Conservatoire National de Paris. He is currently professor of orchestration at the Conservatoire National de Région d’Aubervilliers. This is a disc that dazzles and enchants. 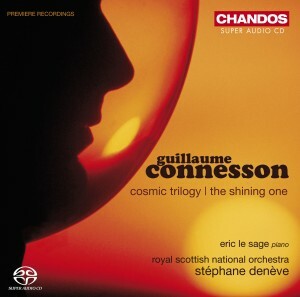 In his Cosmic Trilogy, Guillaume Conneson seeks to encapsulate the mysteries of the universe in the form of a symphony in three movements…” “Connesson captures the various events with cinematic precision and virtuosic allure, which the RSNO and Stephane Deneve respond to with infectious alacrity. Hot off the creative press, The Shining One is a pyrotechnical pianistic challenge dispatched with nonchalant ease by Eric Le Sage.